Even before cyclone Idai started in all its intensity, telephone contacts with Beira were already broken. The last words of a terrified guard at my house: "There is so much noise, everything is flying through the air and sea water is flowing in my street!" A few days after the storm we received the first photos via WhatsApp, I realized that the impact of the cyclone must be catastrophic. The management of VEI decided to evacuate its regional team in Beira before the cyclone Idai landed. On Tuesday morning at 6 o'clock our team got on the plane to Beira again. Ministers of the Mozambican government, including the prime minister and more senior officials, were also on the plane. The atmosphere was tense and everyone was busy discussing. The General Director and Operational Director of FIPAG (Mozambican Drinking Water Company) were also on board. For me there was an immediate opportunity to join the crisis team for the drinking water supply. We arrived in Beira in the rain. The airport was badly damaged. There were holes everywhere in the roof of the arrival hall and the entire roof was blown away from the cargo hall. Wherever I looked, there were fallen trees and asbestos from the broken roof sheets. Because there was so much extra luggage, the airline decided to take us to Beira without the suitcases. No power, no telephone and therefore no information about subsequent flights, you can guess which chaos immediately arose after arrival. I had agreed with the management of FIPAG to first see what my home situation would be like. We would meet again later in the day. We drove zigzagging between trees, power poles and rubble debris towards the city. The chaos made a deep impression on me. No house was undamaged. Everywhere there were blown down trees, roofs and windows of the houses were out, and even completely collapsed houses. That scared me a lot about what I would find at home. A big relief was there when I stood in front of the gate and the house was still there. The house was damaged, the roof was partly blown off and a window was broken. Compared to everything I had seen, it was a huge windfall. However, the garden had turned into a huge mess. The house stands around a large yard with many trees. Except for three trees, they are all blown down. We had already cut down four palm trees preventively, the day before the storm. The trees were close to the cars and the house. In retrospect, that was a good decision, only 2 of the 6 cars have minor damage. On Wednesday morning I set off early with the two FIPAG directors. The mission that FIPAG had from the minister was to bring drinking water to the city of Beira as quickly as possible. A complex and complicated job! The drinking water production company is 60 km from the city, the energy supply is flat and there is no telephone connection. To make and pump drinking water again, the treatment must be more or less okay, we must have chemicals and energy to pump the water. Because there is no energy, we can only pump water if we can get enough generators. After inventory it appears that we can send generators from other cities where FIPAG also supplies water, for example Nacala. But how do we get it in Beira if you can no longer reach the city by road? The Emergency Program is flying in generators, we can get three, but then we will fall short of a few. So we look for a generator in the harbor. Fortunately the port company Cornelder has 1 of 1500 KVA. We need to be able to run purification and pump the water to Beira. There is a feverish consultation with the director of the energy company EDM about the supply of commutators and power cables. We cannot make calls, so we drive like crazy through the city for consultation and coordination. And how do we get it all at the destination, we need trucks, we need cranes to put the generators on the spot. The FIPAG operational team is now busy at the drinking water production company. This location has also been hit hard, the transformer room has been blown away and the pump building no longer has a roof. The pumps are in the rain. Everything must be measured and tested quickly. Pumps must be covered and a provisional arrangement must be made for the generators and commutators. On Wednesday evening at 6 p.m. the minister will be briefed in the crisis center at the airport. On Thursday morning the day starts in another way I expected. The population of Beira has no drinking water for 7 days now. FIPAG drives with 5 water trucks through the city day and night to deliver water to crucial buildings such as the hospital, prison, public buildings etc. People urgently need water, they dig into the pipes and break them in the hope that some water will come out. People also flock to the Munhava distribution center. When I arrived at 7 o'clock in the morning, a few hundred people with water bottles had already gathered in front of the gate. While I drive carefully between people, they chant; we want water! They kick my car and hit the windows! The guards on the site have a fierce argument with the people. As I walk across the terrain I see the damage caused by the cyclone. The regional office, where I also have a desk, has been wiped out. The warehouse and the workshop no longer have a roof and are completely rained out. Everything is floating around, materials are everywhere and nowhere, the laboratory has been destroyed, the pump building no longer has a roof, etc. The archive, the drawings of the technical department are completely soaked, everything is under water. It is too much to comprehend, the water company FIPAG is back after years of construction, unimaginable! We decide that I will drive to the airport to pick up an electro-technical engineer. This specialist is flown in from Maputo to connect the generators and start pumps safely. At the airport I notice what the disaster is currently causing; the provision of assistance seems to be a chaos of people and organizations that are confused and tell each other what they will do. It is difficult to oversee and it seems that every organization acts in its own discretion. Helicopters fly in and out to pick up victims from flooded areas, just outside the city. Two of my colleagues who drove me to the airport also board a large army helicopter. Together with security forces and doctors, they fly to the city of Buzi to make an inventory of the drinking water supply. The city and the surrounding area are completely flooded and cut off from communication with the outside world. The minister wants an update that evening and a proposal to organize the water supply. The generators have now been installed at the drinking water production company in Mutua. The men from FIPAG and EDM have worked through the night and are feverishly busy with the final connections. All connections are checked again and then the button goes, the huge 1500 KVA generator starts with an immense sound, the pumps start 1 by 1; we pump water to the city. No less than 2 million liters of drinking water go to Beira in an hour! Then another thing happens. We find out that a second small generator supplies less power than previously specified. As a result, the purification does not work properly. We must now decide quickly what we are going to do. We decide to bring the generator from the distribution center Manga, a suburb of Beira, to the drinking water production company. We are 60 km outside the city and here the telephone works again and again. The communication is now much better. The generator arrives in the evening. The technicians from FIPAG and EDM are once again working around the clock. Many have been on the move for more than 48 hours to get the drinking water supply going. By midnight it is time for us to be able to produce drinking water and pump it to the 9 reservoirs of Munhava in Beira. Friday morning, we can communicate better with the Netherlands. Together with the Dutch Ministry of Foreign Affairs (RVO), VEI is thinking about how we can best help FIPAG in this disaster. If we pump water, we will find that the pipes are leaking everywhere. An emergency aid program must be decided. 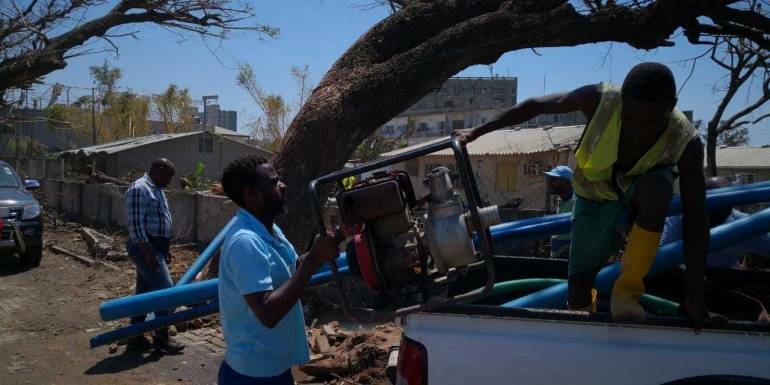 Pipe materials and fittings that are already in Beira for a project financed from the Netherlands are released by RVO to use for repairs, we can now act very quickly. The organization managed by VEI is instructed to guide this next step. The time has come. The reservoirs in the distribution center in Muhava are full, and FIPAG starts the pumps that distribute the water to the various neighborhoods in the city. In a meeting at which the General Director of FIPAG addresses the Beira staff, he praises the commitment during this first phase. Imagine if your house was blown flat, all your personal belongings were wet or lost, and then you show such a commitment! In a ghost town that has turned into a big chaos without resources such as energy and telephony and without outside help bring this together. Respect to the resilience that my Mozambican colleagues have shown!